Gain control with a near real-time and consolidated view of your budget. 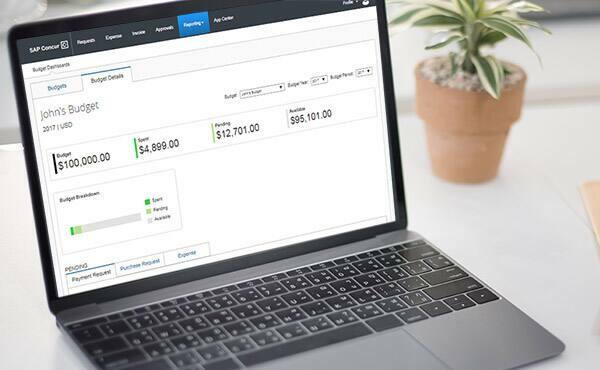 Our connected platform collects and synthesizes continuously updated data from Concur Expense, Invoice, and Request for a holistic view of spend. Get access to flexible workflows and permissions 24/7 through the SAP Concur mobile app, and take the right action at the right time – customizable alerts ensure you are never caught off-guard. Control who sees what with custom hierarchies. Set permissions – from visibility to approval rights – to ensure people are connected to the business budgeting tools they need. Contact us for information on how we can provide what you need for your business. Complete the form to have a consultant contact you. Reduce the hours, effort and costs put into the entire accounts payable process – from purchase request to invoice capture and payment.